Department of Rasashastra and Bhaishajya Kalpana, Institute for Post Graduate Teaching and Research in Ayurveda, Gujarat Ayurved University, Jamnagar, Gujarat 361008. Department of Rasashastra and Bhaishajya Kalpana, All India Institute of Ayurveda, New Delhi 110076, India. Correspondence to: KITE THIS RESEARCH As Harmeet K, Galib R, Patgiri BJ, Bedarkar PB, Prajapati PK. Synoptic Review on Aṣṭāngavaleha - A Polyherbal Ayurvedic Formulation for Bronchial Asthma. J Ayu Med Sci 2018;3(1):296-303. Avaleha (Linctus) is a unique dosage form of Ayurveda that is frequently used in various disorders and as Rasāyana (Immunomodulators). Aṣṭāngavaleha is one such formulation being used for Svasa (Asthma), Jvara (Fever), Hikkā (Hiccup) and Kasa (Cough). Aṣṭāngavaleha has not been mentioned in Brūhattrayī. Ithad been extensively reviewed from Vrndamādhava, Cakradatta, Vangasena, Ġadanigraha, Śārangadhara saṁhitā, Bhāvaprakāśa and Yogaratnākara. Screening through various texts revealed that Aṣṭāngavaleha has been mentioned in these treatises with few modifications like changes in Anupāna (vehicle) or few ingredients. An attempt has been made to compile scattered information about Aṣṭāngavaleha from the texts of 9th to 20th AD explaining its pharmacological potential in Svasa along with the pharmacological activities of its ingredients from Brūhattrayī and Nighaṇṭus. Among these texts, Aṣṭāngavaleha had been mentioned by different name in four texts, with different Anupāna (adjuvant) in one text, its use for different disease in two texts, mentioned with different ingredients in two texts and with different preparation method and Anupāna in Ayurvedic Pharmacoepoeia of India. This work may prove a torch bearer for future research works on Aṣṭāngavaleha. In Ayurveda many multiple component preparations like Avaleha (linctus) are used in the treatment of various disorders and as Rasayana (immunomodulators). Some known Avalehas are Bhārangyādi avaleha, Vāsāvaleha, Cyavanprāśa avaleha and Kansaharītakī[1-5].Aṣṭāngavaleha is one of the important Avaleha formulation used for Śvāsa (respiratory disorders). As the name suggests, Aṣṭangavaleha comprises of eight powdered ingredients in equal proportion that is to be licked with Ārdraka svarasa (expressed juice of ginger rhizome) and Madhu (honey). It is known to pacify symptoms of diseases like Hikkā (Hiccup), Śvāsa (Asthma), Kāsa (Cough), kaṇṭhavarodha (Obstruction in throat) and Sannipātaja jvara (Fever). According to Cakradatta, it also works on Ūrdhvagalaśleśmā (excessive Kapha humourin upper respiratory tract). Present review explains the pharmacological potential of Aṣṭāngavaleha in Śvāsa along with the pharmacological activities of the parts used of each ingredient in the formulation. In this review, information from various texts belonging from 9th AD to 20th AD has been compiled. Aṣṭāngavaleha had been described in these texts under different names and with some modifications (Table 1). This article may help the researcher and practitioner to explore more about Aṣṭāngavaleha. A review has been made through texts in which Aṣṭāngavaleha is mentioned. It is not mentioned in Brūhattrayī. So information about Aṣṭāngavaleha had been compiled from the texts of 9th to 20th AD. For this, Vrndamādhava, Cakradatta, Vangasena, Ġadanigraha, Śārangadhara saṁhitā, Bhavaprakasa and Yogaratnakara were screened. Classification of the ingredients of Aṣṭāngavaleha have been taken from Caraka saṁhitā, Suśruta saṁhitā, Aṣṭānga hrdaya, Aṣṭānga sangraha, Bhāvaprakāśa Nighaṇṭu, Madanapāla Nighaṇṭu, Dhanvantrī Nighaṇṭu, Śoḍhala Nighaṇṭu, Kāiyadeva Nighaṇṭu and Nighaṇṭu Ādarśa. Along with the review of Aṣṭāngavaleha and its ingredients; description of pharmacological properties of the ingredients from various reputed journals were also collected. This formulation was not described in Brūhattrayī.Vrndamādhava(9th century) had described this formulation for the first time. Later on this formulation appears in Cakradatta (11th century), Vangasena (12th century), Ġadanigraha (12th century), Śārangadhara saṁhitā (13th century), Bhāvaprakāśa (16th century) and in Yogaratnākara (20th century). This formulation has been named as Aṣṭāngavaleha, Aśṭāngāvalehikā and Aṣṭānga lihya by these texts. Bhāvamiśra has mentioned it as Mahākaṭaphaladi yoga.Its different names, changes appeared in different texts had been mentioned in the Table 2. Aṣṭāngavaleha comprises of Kaṭphala, Puṣkaramūla, Śrūngī, Vyoṣa (Śuṇṭhī, Marica, Pippalī), Yāsa, Kārvī in powder form and are to be licked with Madhu and Ārdraka svarasa. Categorization of the ingredients of Aṣṭāngavaleha according to various classical texts i.e. from Caraka saṁhitā, Suśruta saṁhitā, Aṣṭānga hrdaya, Aṣṭānga sangraha, Bhāvaprakāśa Nighaṇṭu, Madanapāla Nighaṇṭu, Dhanvantrī Nighaṇṭu, Śoḍhala Nighaṇṭu, Kāiyadeva Nighaṇṭu and Nighaṇṭu Ādarśa have been placed at Table 3. Only classifications of the ingredients of Aṣṭāngavaleha have been available in these texts; though formulation has not been mentioned in these treatises. Ingredients with their different names are depicted in Table 4 and the source of the synonyms is Bhāvaprakāśa nighaṇṭu. The synonyms are mentioned to avoid confusion between various similar names of the drugs and for identification by different names. Ingredients of Aṣṭāngavaleha and their pharmacological and therapeutic properties[11-61] are depicted in Table 5 and 6. The same formulation can be modified to Avaleha prepared by Pāka method with sweetening agent like jaggery or sugar. This modification in composition makes it more palatable, masks the bitter taste of powder and is easy to consume and dispense. Table 7 shows Rasa panchaka of Ārdraka svarasa, Madhu as Anupāna(vehicle) and Sweetening agent Jaggery if used as modification. Considering the same ingredients of the formulation, Aṣṭāngavaleha had been named differently as Mahākaṭphaladi yoga in Bhāvaprakāśa. Bhavamiśra had mentioned to take it with Ajākṣīra as Anupāna in Śvāsa cikitsā. Ajākṣīra possess Dīpana, ḻaghu, sangrāhī properties. It has qualities like Snigdha, ġuru and rasāyana. It is Alpa abhiṣyandī and has Madhura rasa, Madhura vipāka and mainly combat Rājyakṣmā, śvāsa, kāsa and raktapitta. On the contrary, Ārdraka does Āmapācana, dīpana, rocana, vātānulomna and pācana, helping to relieve Agnimāndya and thus Jvara. So in Jvara cikitsā, it is mentioned to be taken with Madhu and Ārdraka by Acharya Bhavamishra. With the same ingredients and Anupāna, again Bhavamiśra has mentioned it in and kāsayukta mūrchā. Srotasa avarodha in these conditions get relieved by its ingredients when used with Ārdraka. As per Cakradatta and Yogaratnākara, ingredients and Anupāna remain the same and formulation is mentioned as Aṣṭāngāvalehikā. The powder of the formulation has to be licked with honey and it pacifies Sannīipāta jvara, hikkā, śvāsa, kāsa and kaṇṭharodha. In case of Kapha ādhikya, mixed powder of the eight ingredients of this formulation is to be taken with Ārdraka rasa. In Ġadanigraha and Vangasena, Śrūngi has been replaced with Bhārangī (Clerodendrum serratum Spreng.) in Aṣṭāngāvalehikā and Aṣṭānga ḻihya respectively mentioned in Jvara adhikāra with Madhu and Ārdraka as Anupāna. Bhārangī has Kaṭu, tikta rasa, laghu, rūkṣa guṇa, uṣṇa vīrya, kaṭu vipāka and kapha vātaghna properties. Śrūngi has Kaṣāya, tikta rasa and rest other properties are exactly the same as that of Bhārangī. Parts used for Bhārangī is either root or leaves whereas gall is used of Śrūngi. So part used of Bhārangī i.e. leaves and root are more easily approachable for therapeutic needs. May be due to easy avalibility later on Acharya Śoḍhala and Vangasena had used Bhārangī in place of Śrūngi in base formulation of Aṣṭāngavaleha. In Ayurvedic Formulary of India (AFI), Aṣṭāngavaleha has been prepared with the same eight ingredients along with Anupāna of the formulation i.e. Madhu and Ārdraka svarasa taking all in equal proportion. The therapeutic dose ofAṣṭāngavalehais mentioned as 500 mg to 1 g and has been indicated for Vāta kapha jvara (Fever due to Vata Dosha and Kapha Dosha), Kāsa (Cough), Śvāsa (Dyspnoea/Asthma), Aruci (Tastelessness) and Chardi (Emesis). In Ayurvedic Pharmacoepia of India (API), Aṣṭāngavaleha is described as a blackish brown coloured semisolid sticky paste with pleasant odour, bitter, astringent and spicy taste. This preparation is made with eight ingredients i.e. Kaṭphala, Puṣkaramūla, Śrūngī, Yavānī, Kārvī, Śuṇṭhī, Marica, Pippalī all in equal parts and Madhu is taken in 12 parts with quantity sufficient (QS) Ārdraka svarasa for bhāvanā. Here method of preparation of Aṣṭāngavaleha has been mentioned, where all eight ingredients are first washed, dried and powdered separately and passed through sieve no 85; Ārdraka rhizomes are washed, peeled and grinded to squeeze the juice and filtered it through a muslin cloth to collect Svarasa. Powdered ingredients are mixed thoroughly, levigated with Ārdraka svarasa and the mixture is dried. Honey is added and stirred thoroughly to form an Avaleha. After that it is packed in tightly closed containers to protect from light and moisture. The therapeutic dose ofAṣṭāngavaleha has been indicated to be 3 to 5 g daily in divided doses and water is taken as Anupāna. In addition to this, physico-chemical parameters, ingredients’ identification microscopically and Thin layer Chromotography of the formulation has been described in API. Because of their relative significant efficacy in Śvāsa, comparative longer shelf life and palatability, the role of Avalehas in the field of Shwasa (Asthma) is distinctly evident. Screening through the classics reveal that, seers used Sahapāna with drugs like powder, making the dosage form convenient for licking. But Avaleha as dosage form is widely used and better acceptable form in current days than intake of drug in the form of powder. Also patient may find it difficult to consume it with Ārdraka rasa as Anupāna everytime. Considering this, in API, rather than taking the powder form of this formulation with fresh squeezed juice of Ārdraka rasa as Anupāna; Bhāvanāof the same has been subjected to the mixture of powder of the eight ingredients of the formulation and Madhu is taken as Anupāna for the same. With the changing time, rather than taking the powder form of this formulation with fresh squeezed juice of Ārdrakarasa as Anupāna; Bhāvanā of the same has been subjected to the mixture of powder. This formulation can be modified to Avaleha prepared by Paka method with sweetening agent like jaggery or sugar making it more palatable, masking the bitter taste of powder, making it easy to consume and dispense. All the ingredients of Aṣṭāngavaleha possess anti-inflammatory property in common. Kaṭphala, Puṣkaramūla, Śrūngī and Pippalī are well reported for their mast-cell stabilizing and anti-asthmatic activity. Marica and Pippalī are bio-availibilty enhancers. However, Marica, Śuṇṭhī and Yavānī possess antimicrobial acivity whereas Yavānī has been reported for its bronchodilatory, anti-tussive and expectorant activities. All these properties of ingredients of Aṣṭāngavaleha made it a good remedy for combating the symptoms of asthma and other inflammatory condition. Drugs with Vāta kapha hara and Vātanulomana properties are beneficial in case of Tamaka śvāsa. Śuṇthī and Pippalī possess these qualities and rest of all the drugs are Vāta kapha hara and may be beneficial in this condition. These ingredients also possess Vātanulomana, Dīpana, Pācana, Kāsahara, Śvāsahara, Vednāsthāpana and Śothahara properties. Overall properties of Aṣṭāngavaleha make it perfect blend to pacify the symptoms of Śvāsa and Kāsa. Aṣṭāngavaleha (Bhāvaprakāśa Jvara cikitsā. 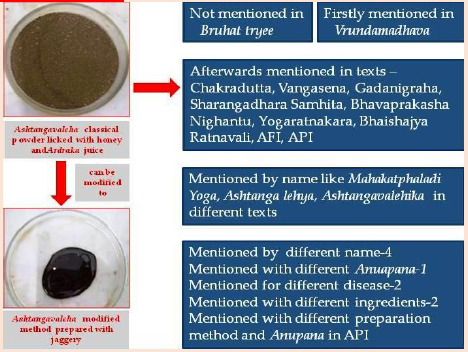 1/559, p.116) Again with the name of Aṣṭāngavaleha, this formulation has been mentioned with the same ingredients but with honey and Ārdraka Rasa as Anupāna. Aṣṭāngavaleha (Bhāvaprakāśa 1/560, p.116). The same composition mentioned for Tandrā, and kāsayukta mūrchā. Aṣṭāngāvalehikā (Yogaratnākara, 3, p.210; Cakradatta 1/162-164, p.72). Yogaratnākara has mentioned it under Jvara adhikāra (3), p.210, with slight change in its name. Similarly with this name, it is mentioned in Cakradatta 1/162-164, p.72. Aṣṭāngavaleha (APIPart II Vol I; 1, p.44). In API, The same ingredients are subjected to bhavana of Ārdraka Svarasa, mixture is dried and honey is added to form Avaleha. Water is used as Anupāna. It is indicated for the same diseases like as mentioned in AFI. APIPart II Vol I; 1, p 44 (AFI Part II, 3:1). Vrndamādhava firstly contribute Aṣṭāngavaleha to the Ayurvedic pharmaceutics and this was repeated thereafter in various texts by Ācāryas. Ācāryas had mentioned the basic formulation composition with different Anupāna and ingredients in different disease conditions accordingly. With the changing time, rather than taking the powder form of this formulation with fresh squeezed juice of Ārdraka rasa as Anupāna; Bhāvanā of the same can be subjected to the mixture of powder or can be modified to Avaleha making it easy to consume and dispense. The pharmacological activities of the ingredients of Aṣṭāngavaleha have shown their use as anti- inflammatory, anti-asthmatic, anti-allergic, mast cell stabilizing, antihistaminic and antioxidant drugs. So this review helps the researcher to explore this formulation for more pharmacological activities of Aṣṭāngavaleha. Authors acknowledge authority of Institute for Post Graduate Teaching and Research in Ayurveda, Jamnagar for providing facilities for the study. Source of support Institute for Post Graduate Teaching and Research in Ayurveda, Jamnagar. Dr Harmeet made substantial contributions to conception and design of the work, literature search, acquisition of data, analysis and interpretation of data; and manuscript preparation. Dr Galib participated in drafting the article and revising it critically for important intellectual content.Prof. BJ Patgiri participated in revising the article critically. Dr Prashant Bedarkar participated in drafting the article and revising it critically for important intellectual content. Prof. PK Prajapati participated in idea of drafting this concept and given final approval for submission of the article. Najda A, Dyduch J, Brzozowski N , authors. Flavonoid content and antioxidant activity of caraway roots (Carum carvi L.). Veg Crops Res Bull. 2008;68:127–133. doi: 1 0.2478/v1 0032-008-0011-6. ‹ Impact Factor and UGC List of Approved Journals - Boon or Bane? Impact Factor and UGC List of Approved Journals - Boon or Bane? Pharmacognostical and Phytochemical Characterisation of Cork and Seed of <italic>Tamarindus indica</italic> Linn.